A big thank you to everyone who sent me emails and left comments in regards to my search for an antique textile to cover my living room's half table. 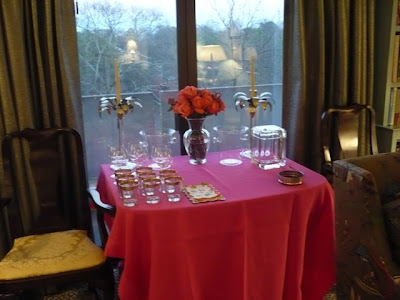 That's it above, covered in a hot pink linen tablecloth, being employed as a drinks table. A lot of you sent me links to sources for actual antique textiles, while others pointed me in the direction of fabric that has the look of old but that is actually new. I haven't made up my mind yet what I plan to do. Decisions, decisions. In the meantime, I'll share some of these sources with you- just in case you too have a table that you want to disguise. Mary Jane McCarty has an amazing collection of antique textiles, tapestries, Aubussons, and trims that she uses to make the most beautiful pillows and accessories. In fact, she has sold her pillows through Bergdorf's for years. The photos above show her current collection for the retailer, one that was inspired by Scottish castles. Mary Jane used antique toile, metallic trim, early embroidery, and Aubusson for these charming pillows. I invite you to visit her website to see a broad range of her work which includes lamp shades, throws, and Christmas stockings. She also welcomes custom projects and counts Bunny Williams, John Rosselli, Kathryn Ireland, and Michael Smith as clients. In case you can't make it to Bergdorf's to see her pillows in person, you can always visit her Etsy shop. A savvy reader of mine, Mary, loves Indian bedspreads and used to buy them at Urban Outfitters ages ago. According to Mary, they make great tablecloths and they fade beautifully as well. 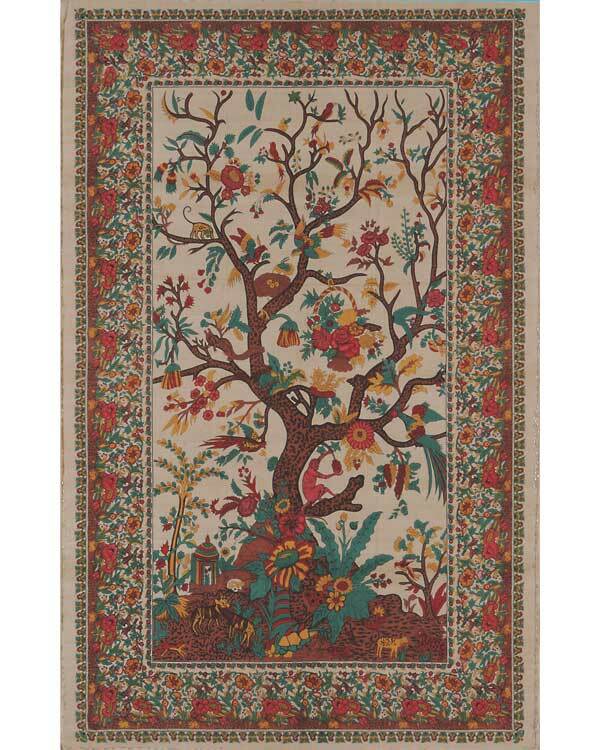 She recommends the Tree of Life tapestry bedspread from Turtle Island Imports. I'm showing the cream colorway above. They come in different sizes and colors, but the best part is the price: they range from $27-$44. So, if you're using it as a tablecloth and somebody spills red wine, you don't have to have a heart attack. You can simply throw it in the washing machine or even just buy a new one. Another website that Mary likes is Tilonia Home. 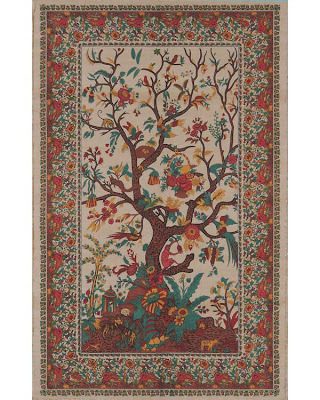 They too sell beautiful Indian bedspreads that include batiks and floral prints. 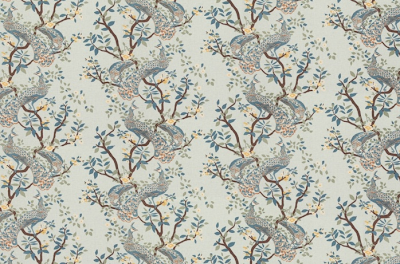 Another suggestion was the new Timeless Linen collection from Calico Corners. These pretty linen and cotton blend fabrics, made in either the US or the UK, look like something you might find in an old English cottage. The print above is Llyta Firecracker. 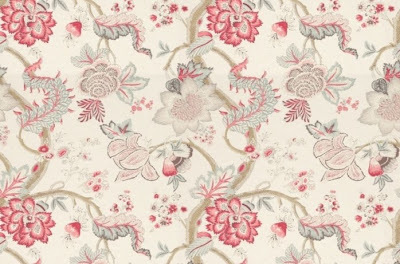 It's so charming and feminine...and it's currently on sale too through the end of March. Then again, Calico Corner's Vintage Plumes is awfully good looking as well. And finally, a lot of you encouraged me to use some Braquenié fabric for a cloth. You know that I have a weakness for Braquenié, and I did find a few options. Not that they were difficult to find! 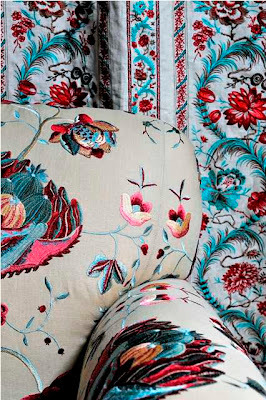 I'm very taken with the new Embroideries collection, due to be released in the US on September 1. The collection consists of embroidered linens, cottons, and silks. Here's a peek at part of the collection. 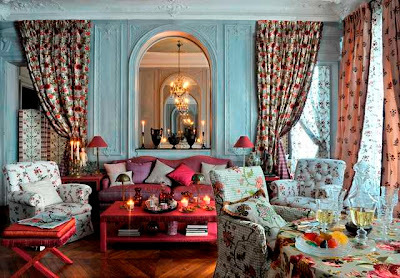 Aren't the fabrics stunning? Photos courtesy of Mary Jane McCarty, Turtle Island Imports, Calico Corners, and Braquenié. Thanks for sharing your sources, wonderful all. 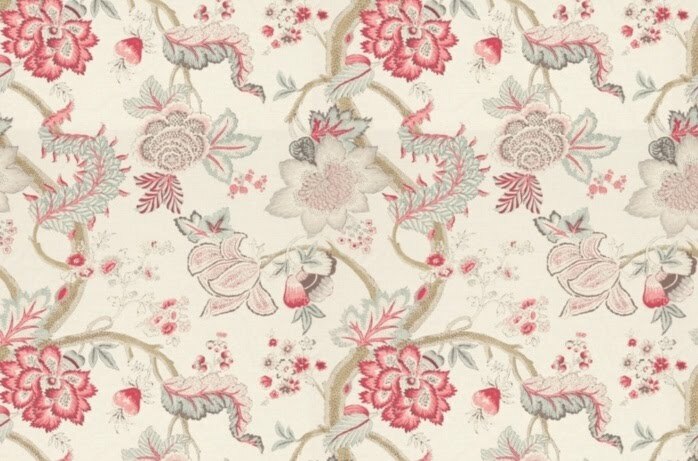 I predict success for the embroidered Braquenie fabric in spite of an anticipated high price; that new line is sure to be gorgeous. I purchase many of my linens at flea markets. Metrolina Flea has some sensational vendors. 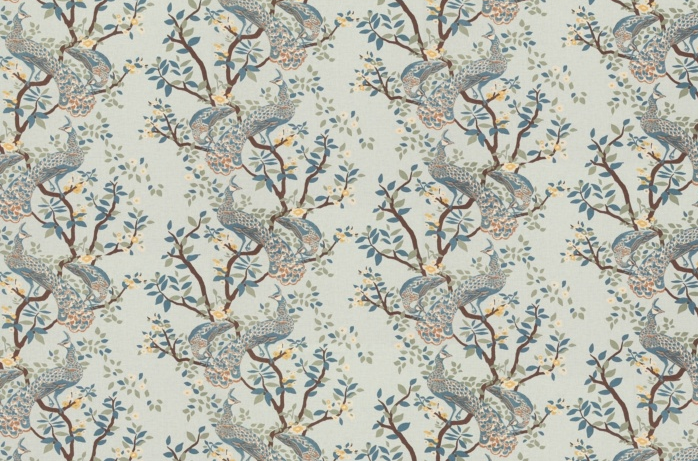 Braquenié is one of my all time favorites - would love to have a bedroom all upholstered with their fabric!! 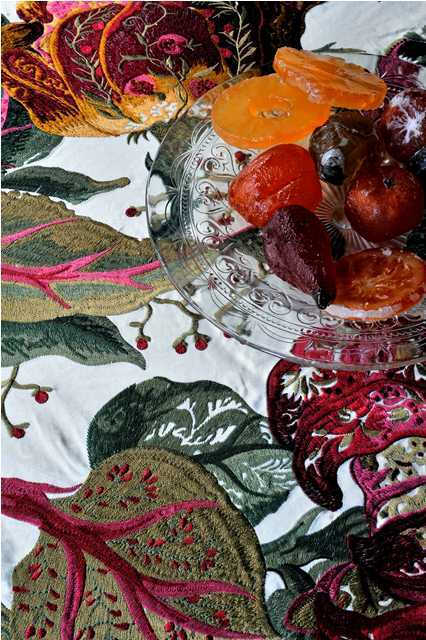 Regardless of which fabric you use it will look wonderful if you make a fitted cloth for the table. The pink is pretty, even, it just doesn't hang well on the shape of the table. Trace the shape of the top and then make panels to go down each side to floor. Then make slim under panels for each corner; these make the corner look pleated but it lies very flat. Line all the pieces with thin inexpensive fabric. This sounds complicated but it isn't; it just takes time. Even a less expensive fabric will look like a million if you put effort into the craftsmanship. These are great tips Sheila! Thank you!